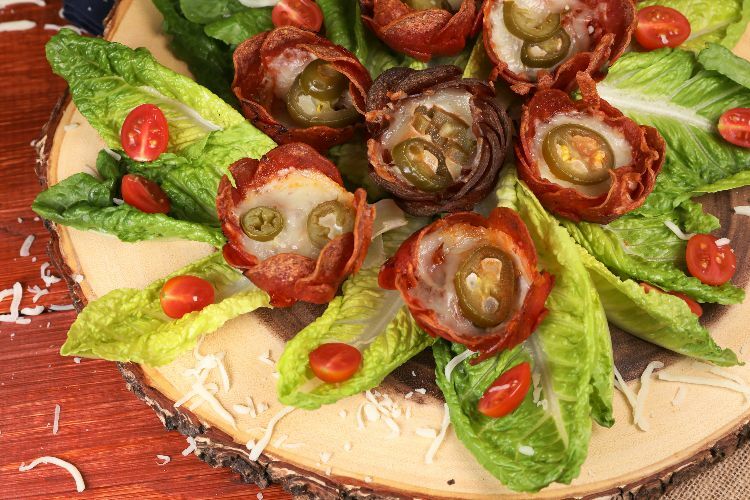 Cheesy and spicy, these low carb pepperoni pizza cups make delicious snacks! In the recipe below pepperoni is baked until crispy and then filled with all the best pizza toppings - mozzarella cheese, sliced jalapeños, and of course, pizza sauce. So you can have everything you love about pizza in just a few bites, and with no carbs included. You can use either larger sandwich pepperoni slices and just fit them into a muffin tin, or you can do what I did and use the smaller slices. These have to be cut on the sides slightly so they'll better hold and stay together, but they're what I had on-hand and so, they're what I used. It does take a little extra work, but it's worth it. And if spicy isn't your thing, don't think you have to use those either. Try sliced black or green olives, or even more pepperoni! Preheat the oven to 400 degree Fahrenheit. 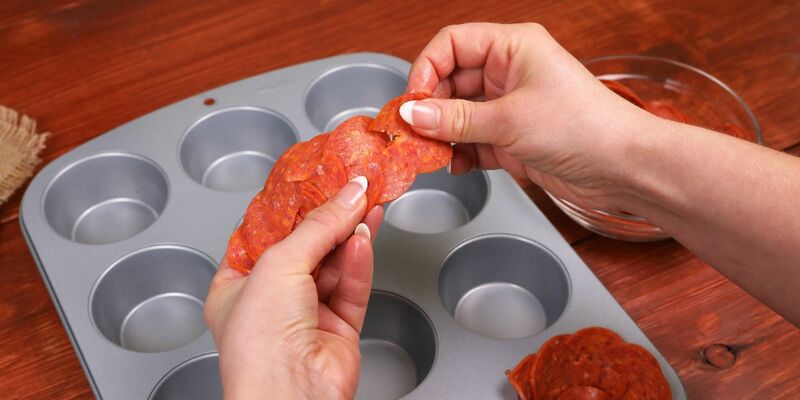 Cut small slits into the sides of the pepperoni so you can interlock them together. This will help them keep their shape. When all the pepperoni has a slit in it, fit them into the sides of a muffin tin and then place one pepperoni on the bottom, slightly overlapping the pepperoni covering the sides. Continue with the rest of the pepperoni until the entire tin is full. Place into the hot oven and bake for 10 minutes. Remove from the oven and allow the pepperoni to cool slightly. This will help the pepperoni set into a cup. Preheat the broiler. Add a teaspoon of pizza sauce into each pepperoni cup and then add 1 tablespoon of shredded mozzarella. Top with one jalapeño slice. Place pepperoni cups under the broiler and broil for about 5 minutes, just until the cheese has melted.